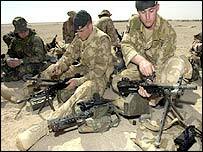 British troops waiting to attack Iraq have been told to behave like liberators rather than conquerors. 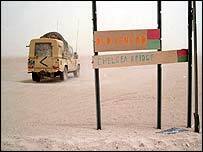 But they have also been warned some of them may not return from Iraq alive. 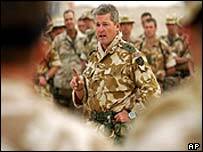 Lieutenant Colonel Tim Collins gave the battlegroup of the 1st Battalion of the Royal Irish the pep talk as the US deadline for Saddam Hussein to leave Iraq or face action ticked away. Reporters said the men listened in silence to the address at Fort Blair Mayne desert camp, 20 miles from the Iraqi border. "We go to liberate not to conquer. We will not fly our flags in their country," he said. "We are entering Iraq to free a people and the only flag which will be flown in that ancient land is their own. Show respect for them. "There are some who are alive at this moment who will not be alive shortly. Those who do not wish to go on that journey, we will not send. "As for the others I expect you to rock their world. Wipe them out if that is what they choose. But if you are ferocious in battle remember to be magnanimous in victory. "Iraq is steeped in history. It is the site of the Garden of Eden, of the Great Flood and the birthplace of Abraham. Tread lightly there. "Don't treat them as refugees for they are in their own country. Their children will be poor, in years to come they will know that the light of liberation in their lives was brought by you. "If there are casualties of war then remember that when they woke up and got dressed in the morning they did not plan to die this day. "Allow them dignity in death. Bury them properly and mark their graves." To his 800 men - an arm of the 16 Air Assault Brigade - he said: "It is my foremost intention to bring every single one of you out alive but there may be people among us who will not see the end of this campaign. "We will put them in their sleeping bags and send them back. There will be no time for sorrow. "The enemy should be in no doubt that we are his nemesis and that we are bringing about his rightful destruction. "There are many regional commanders who have stains on their souls and they are stoking the fires of hell for Saddam. "He and his forces will be destroyed by this coalition for what they have done. As they die they will know their deeds have brought them to this place. Show them no pity." He said: "It is a big step to take another human life. It is not to be done lightly. "I know of men who have taken life needlessly in other conflicts, I can assure you they live with the mark of Cain upon them. "If someone surrenders to you then remember they have that right in international law and ensure that one day they go home to their family. "The ones who wish to fight, well, we aim to please." He warned the troops not to get carried away in the heat of battle. "If you harm the regiment or its history by over enthusiasm in killing or in cowardice, know it is your family who will suffer. "You will be shunned unless your conduct is of the highest for your deeds will follow you down through history. We will bring shame on neither our uniform or our nation." Warning that the troops were very likely to face chemical or biological weapons, he said: "It is not a question of if, it's a question of when. We know he has already devolved the decision to lower commanders, and that means he has already taken the decision himself. If we survive the first strike we will survive the attack." His closing words were resolute: "As for ourselves, let's bring everyone home and leave Iraq a better place for us having been there. Our business now is north."